Boat registrations in January grew 2.5 percent in the main powerboat categories and 0.4 percent in all categories, giving the industry renewed confidence after a lackluster end to the fourth quarter of 2018. Pontoon registrations — a segment still leading industry growth — grew 13.4 percent, and ski and wake grew 12.2 percent, according to Statistical Surveys, a Michigan firm that tracked new boat registrations from 31 early-reporting states that account for almost 64 percent of the U.S. boat market. In Florida, 177 pontoon boats were registered in January. “Although January remains in the typical out-of-season boat-buying period, we view the reversal of negative trends experienced during November and December as a positive sign for the industry as the first month to potentially benefit from a more stable capital markets environment for buyers,” Wells Fargo analyst Timothy Conder says. 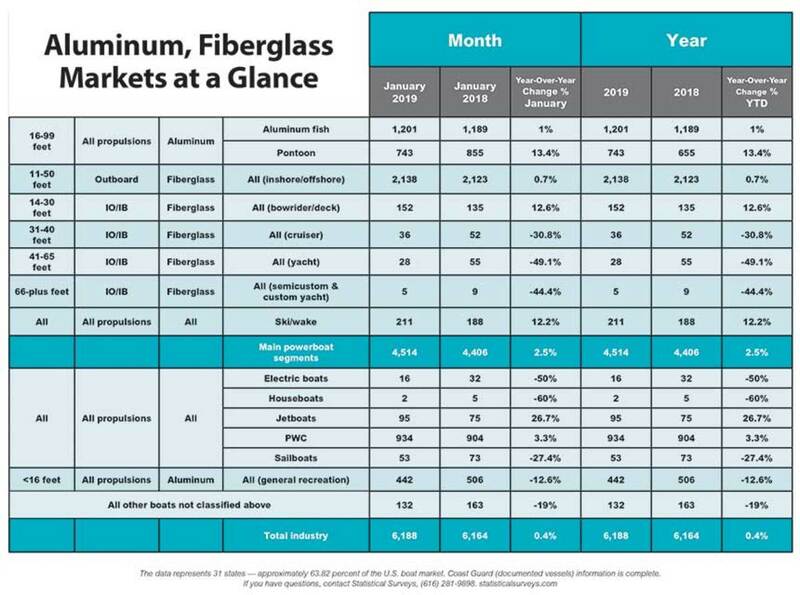 Fiberglass outboard boats, the largest January category with 2,138 units registered, grew 0.7 percent over last year. “We’ve really set a tone here over the last few years — not really much has changed in terms of segmentation and what’s grown and what’s not,” SSI sales director Ryan Kloppe says. Aluminum fishing boats were up 1 percent after some softness. A standout category was sterndrive and inboard boats, which rose 12.6 percent, further indicating that the segment might be finding a new foothold. Cruisers and yachts saw January declines in double-digit percentages; the category has been somewhat erratic since Sea Ray announced that it would stop building boats in that category. Dealers reported strong sales of larger and high-end boats at the winter boat shows, and that those sales should show up in registration data in the future, Kloppe says. “We are hearing a number of attractive trends that would not be visible in the January new-boat sales data but should start to positively impact both monthly sales trends and quarterly results in the coming weeks,” says B. Riley FBR analyst Eric Wold. Companies are seeing strong boat-show demand, including post-show lead follow-up, Wold says, with waiting lists for many key models. Promotions are at low levels, which indicates strong demand and should help margins, he says. And boat buyers are moving up in average selling prices to take advantage of continued technological advancements. Feedback from some shows was spottier, and it varied between segments and even among different locations selling the same brand. “The performance is not spread like peanut butter this year,” says BMO Capital analyst Gerrick Johnson.